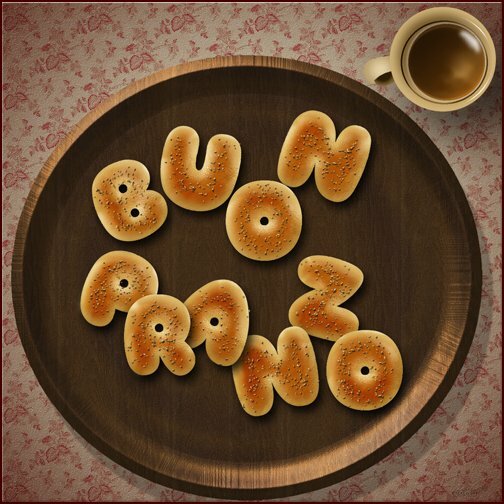 Bagels are a donut-shaped type of bread made with flour. They look absolutely amazing when well baked and shiny! Wood Patterns pattern by Loungedy. Concrete wall by Atle Mo. Create a new 1250 x 1250 px document (you can use any Width value you like, but make sure that the Height value is not less than 1250). Pick the Rectangle Tool, Set the Foreground color to #d4d0c9, and draw a rectangle that extends a little bit outside the document. Click the Gradient box to create the gradient. To create the Gradient, you’ll need to click below the gradient bar to add Color Stops, and above it to add Opacity Stops. This gradient is created using two colors #ffffff to the left, with the Opacity 0%, and #6e3c32 to the right, with the Opacity 100%. This will create the main background. Set the Foreground color to #d8d1b9, pick the Ellipse Tool, then press and hold the Shift key, and click and drag to create a circle that fits within the document. This will create the bowl/dish/plate material. You can play around with the Bevel and Emboss values, or use different colors and textures if you like. Create the first letter of the word you want to create in All Caps, using the font Franks, the color #e3d1ab, and the font Size 570. You can work simultaneously on all the letters, or work on each one separately. That’s totally up to you. If the letter contains closed counters (holes), you’ll need to convert it to a shape to remove the sharp corners of the aperture. To do so, right click the text layer, then choose Convert to Shape. Pick the Convert Point Tool, click and drag around the sharp corner to select it, then click and drag the anchor point to convert the sharp point into a curve. Then, you might need to pick the Direct Selection Tool, click and drag the points to move them around, or click and drag the Direction Points to widen or narrow the curve. The final result doesn’t have to be perfect; in fact, it better be not. 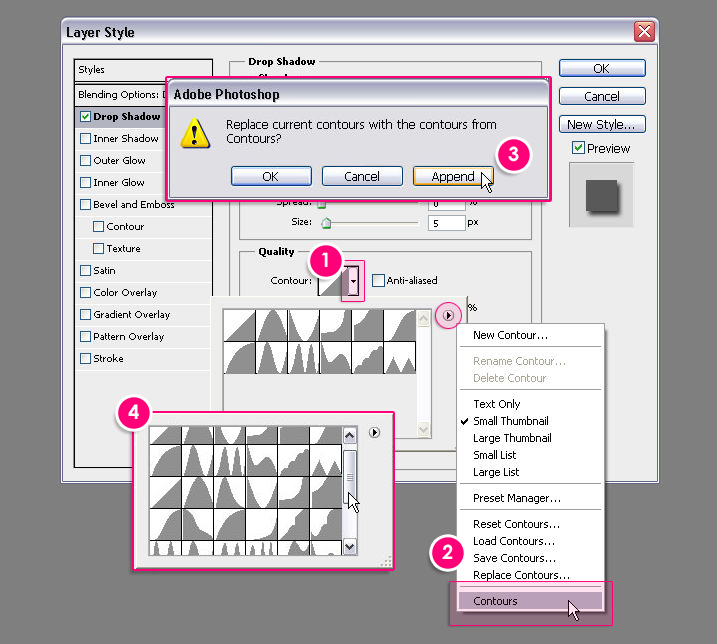 Duplicate the shape layer, change the copy’s Fill value to 0, then duplicate the copy twice. So you’ll have the original text layer, a copy, copy 2, and copy 3 layers. This will create the basic 3D shape of the bagel. Fill : Choose the gradient fill – we’ll create the gradient in a minute. Using a gradient for the glow will help create a dark to light coloring from the center of the letter towards the edges. 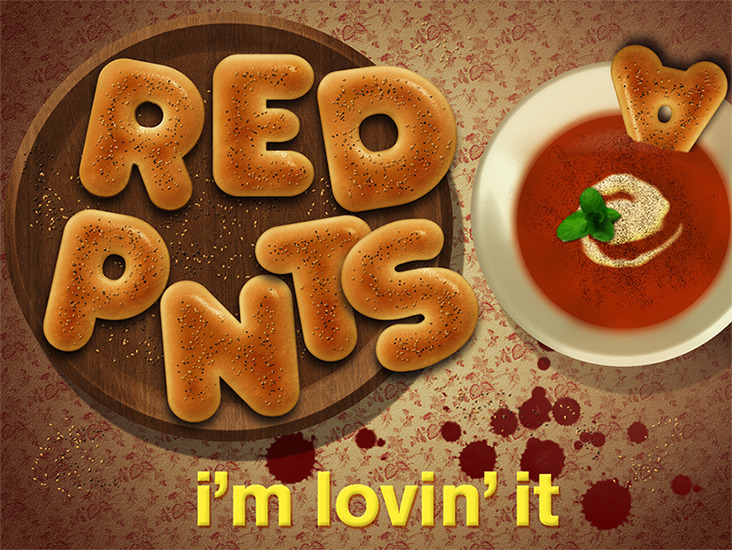 This will add some texture (bump) to the text. This will add some shine. The shine will change its angle when it will be rotated near the end of the tutorial, which will make it more dynamic. Ctrl/Cmd + click any letter layer’s thumbnail to create a selection. Go to Select > Modify > Contract, and type the value 50. This will contract the selection 50 px inwards. Go to Select > Modify > Feather, and type the value 15. This will soften the edges of the selection. Set the Foreground color to #994b0d, pick the Paint Bucket Tool, create a new layer on top of all layers, call it Brown, and fill the selection with the Foreground color. Ctrl/Cmd + click any letter layer’s thumbnail to create a selection one more time. Create another new layer and call it Texture. Set the Foreground color to #e4c8a0 and the Background color to #936d2f. We’ll apply some filters to create a simple texture that will also enhance the coloring of the letter. Start by going to Filter > Render > Clouds. Then Go to Select > Deselect (Ctrl/Cmd + D) to get rid of the selection. Go to Filter > (Filter Gallery) > Sketch > Bas Relief, and change the values as shown below. Go to Filter > (Filter Gallery) > Brush Strokes > Accented Edges, and modify the values as shown below too. That’s it for the texture. Really simple. Change the Texture layer’s Blend Mode to Soft Light. You can see the difference it makes. Pick the Brush Tool, and open the Brush panel (Window > Brush). Create a new layer on top of all layers, call it Color Burn Brush, change its Blend Mode to Color Burn, its Opacity to 45%, and set the Foreground color to #cac2b7. Click and drag slightly to intensify some areas on the letter. This will make the golden-brown part look more realistic. Create a new layer, call it Inner Shadow, and change its Blend Mode to Multiply. Set the Foreground color to #e7cf93 and reduce the Brush Size to 45 px. In the Brush panel, under Brush Tip Shape, set the Spacing value back to 25%. Select the text like you did previously, then paint around the counters to add more shadow. Create another new layer, call it Outer Shadow, change its Blend Mode to Multiply, set the Foreground color to #e3b96d, and increase the Brush Size to 175 px. Click and drag a little bit far from (outside) the selection, and around the letter, to darken the edges. When done, deselect (Ctrl/Cmd + D). This is the main bagel. The next steps are simple additions to this outcome. This will be the main seed brush. Create a new layer on top of all layers and call it Sesame. Duplicate the Sesame layer, and rename the copy to Poppy Seed. Double click the Poppy Seed layer to change the Bevel and Emboss effect’s Shadow Mode color back to Black. 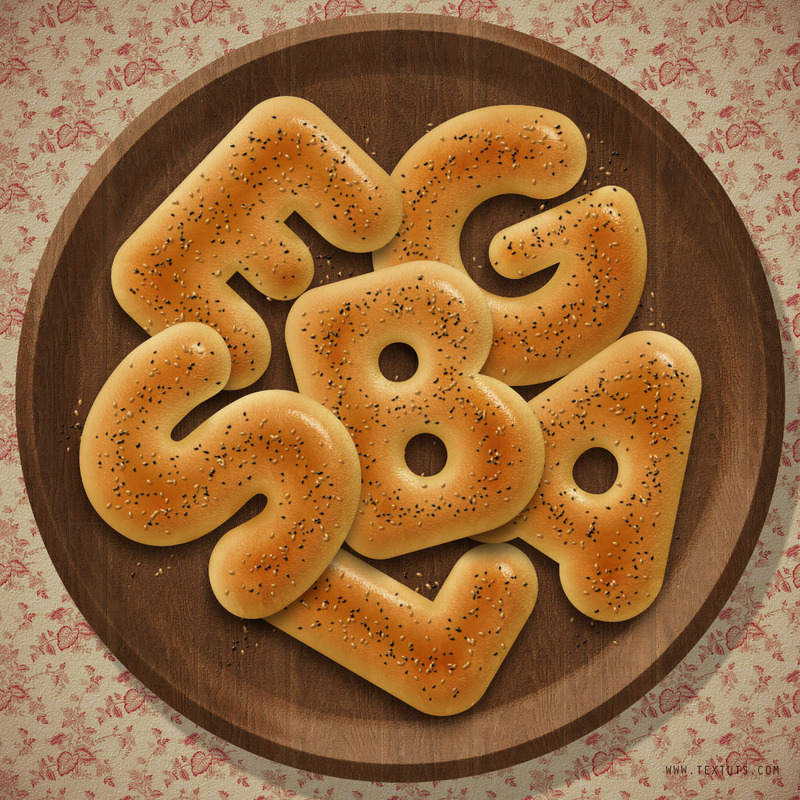 Set the Foreground color to #d4ad6c, select the Sesame layer, then click and drag over the middle part of the bagel letter to scatter the sesame. A helpful tip would be to drag in a subtle zig-zag motion. this will help better spread the seeds much better. Change the Foreground color to #372f2d, decrease the brush Size to 7, select the Poppy Seed layer, then click and drag to add the poppy seeds to the bagel. The bagel letter is finished now. So group its layers, then go ahead and create the other letters. When done, select each group, then go to Edit > Free Transform, to rotate and position the letters inside the bowl. Change the adjustment layer’s Blend Mode to Multiply and its Opacity to 10%. Finally, you can add two more separate Sesame and Poppy Seed layers right on top of the bowl’s layer, and scatter some seeds around to finish off the effect. And there you have your bagels ready! If you have a suggestion or an idea, please feel free to send us an email through the Contact Form. The main reason for getting different results out of using the same Layer Style values is applying them to a text created using a different font or font size. If that’s the case, then you might need to change the values a little bit until they look similar to the result here. If not, then can you please upload a screenshot with the issue? Fantastic … Simply FANTASTIC … You are the best!! Awesome! Well done as always. I love the Photoshop tutorials here, they are so well explained and I get no error when follow the steps, congrats for the site, keep this way. The power of Layer Styles! Thank you very much for the awesome comment. the “Texture Pattern PAPER-2″ .I cannot do this step, ” Loading paper-2 pattern in my document”. please tell me the proper way “how to load paper-2 patern. In order to add (load) the pattern to your preset manager, you’ll need to open the “paper_2.png” image (found inside the “paper_2” folder) in Photoshop, then go to Edit -> Define Pattern, and click OK. 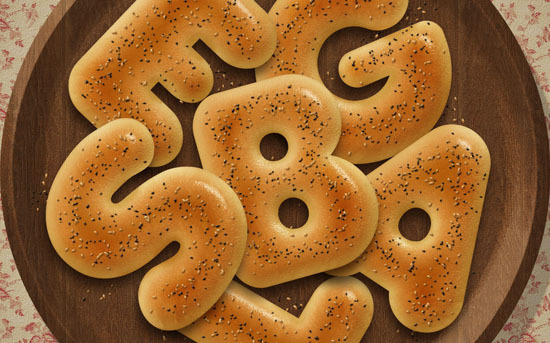 I don’t known how to do “click and drag over the middle part of the bagel letter to scatter the sesame” can you help me! You need to place the mouse cursor in the middle of the letter, click and hold the left mouse button, and drag so that you can scatter the brush. Then you can release the button. i’m looking for you have many tutorial for any beginer like me! Thank you very much for the kind words and for the support, they mean a lot. Yi kan wo du zi jiu you dian e le ! You can go ahead and have some! It’s so nice!I want to eat!Thank you for sharing the excellent tutorial! Merci beaucop for the comment. Not sure which layers are causing the problem. Can you please add the step in which you can’t achieve the shown result? Thank you for the wonderful lesson. I even have an appetite, I’ll go to the kitchen bake something yourself. It was so nice to share such a great tutorials with us.Thank you. I have a question what is the properties of Contour : Cone – Asymmetrical? Is this the con-inversed or different one? It actually is a different contour that you can load into Photoshop. Please take a look at this image to see how to do so. too much hard to do ..
What are the problems you have while trying to create it? Many thanks for the comment and for the link. Your instructions, especially with caps are very easy to follow. Thanks for that. I got the result I wanted but from point of comprehension I am still trying to understand how the contours or different settings in Bevel & Emboss affect the object. Could you please make something to explain that? It will help in my overall understanding of photoshop effects. So that I can use it in other projects as well on my own. Thanks again. … Wonderful result! I really like how you made it a part of a scene. Absolutely awesome! The thing about Contours is that the more you get to use and try different things with them, the more you understand how they work. But that sure would be a good idea for a quick tip article. So will list it down and try to work on it soon. Many thanks for the comment once again. Cool! Both look absolutely great! You can download all the used textures and patterns from the Resources section at the very beginning of the tutorial. Anything used will have a link there. In step 2, I am unable to make the ellipse of that colour even after setting the foreground colour. Why not? Can you double click the shape layer’s thumbnail to change the color after you create it? Please feel free to upload a screenshot of the issue if that doesn’t work. Make sure the ellipse is the top layer. Awesome tutorial, you did a great job! I learned many techniques-thank you!!! very useful and nice. thanks! Hi , I’m stuck on step 5 at changing the gradient colors. My gradient box only has two color locations . i don’t have the third one on the middle ….. Help? You can click on top of the gradient bar to add an Opacity Stop, and below it to add a Color Stop. You can then select each of those to change their values as mentioned in the tutorial. Please feel free to leave a reply with any other questions you have. Loveeee it! 🙂 Very clear and useful tutorial. Thank you so much and it looks delicious indeed! Really glad you enjoyed the tutorial. I think it looks amazing, and I like the colorful sprinkles as well. The coloring depends on the values you use for each part of the text effect, the blend modes, the effects, etc. So you might just need to check those again.